Yesterday the “cable guy” came and disconnected our cable which means we have no TV. Not even local channels. Nothing. This was not the result of an unpaid bill. It is the result of several months of discussion. A few years ago Sherri and I turned off the TV for several months. A couple of things happened during that time: we got more done, we went to bed earlier, we talked more, and surprisingly we were not any less informed about current events! Since that time we have had several (many, in all reality) children. TV has taken the place of creativity and imagination. It has become easy for us as parents (OK, me as a dad) to say, “Go watch TV” in an effort to free up time for myself. In other words, it has become, in many instances, a child-occupier… a babysitter. For the last several months we have been discussing turning it off. Finally we decided to make the call. I’ll miss Spike TV, Discovery and NatGeo and the news channels too. Sherri will miss Spike TV too (just kidding), but she’ll certainly miss the news channels. The kids will miss the Disney Channel and we’ll all miss laughing at America’s Funniest Home Videos. What I won’t miss are behaviors modeled for my kids that I do not approve of (e.g. disrespect for authority, demeaning of women as objects of sexual gratification, etc.). I won’t miss trying to keep my eyes open so I can catch the next segment of a show that I won’t remember the content of one week from now. I won’t miss the cable bill (BTW, we’re putting that money towards our kill-debt plan). Quality and quantity family time! More money now that we no longer have a cable bill! Knowledge that matters because we are encouraging reading before bed time! More completed projects around the house! Creative and improved parenting skills! Since there’s no TV anymore I/we will have to engage more regularly! Imaginative and resourceful children! Since there’s no TV “The Ladies” are going to have to create, play, think and develop the habit of resourcefulness! Fortunately their backyard and rooms are stocked up with resources to help them do just that. 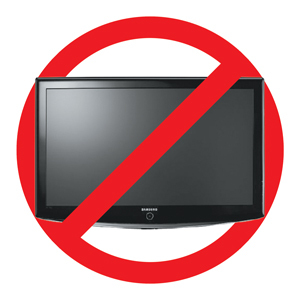 What will we do with our televisions? Keep them to watch movies on Friday Night “Movie Night”! Keep them so I can beat the kids on Wii! Will we ever watch TV? Sure. In fact I am going to a buddy’s house this weekend to watch a pay-per-view fight! The girls will be allowed to watch movies from time to time. We may, someday in the future, turn it on again. So here we go… a journey with no TV. How long will it last? We don’t know, but we’re excited to get underway and see the evolution of our family! < Previous Snake in the yard! These are very good reasons…..I might add one other reason. My biggest problem with Hollywood is they “just leave GOD out”! Unless if they are taking HIS name in vain…it’s as if He doesn’t even exist! Almost never do you hear of…..let’s pray about it…etc. I watch very little TV….it comes with our cable high speed internet wich makes it harder to obliviate. I get tired of all the entertainment though…..then our kids go to church and are BORED!! I wonder if they are being over-stimulated with all this media….from tv….facebook…internet….texting. Not totally against any of it…just concerned about it. I have been TV free for 3 years now. I do watch some at a friends house with her, overall… it was a great choice. and the money savings have made the gas prices absorb-able.